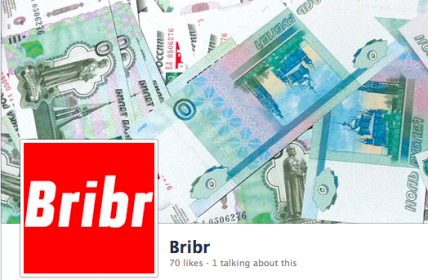 A screenshot of Bribr's Facebook page, featuring the most appropriate Russian currency for bribes: fake 0 ruble bills. A screenshot of Bribr’s Facebook page, featuring the most appropriate Russian currency for bribes: fake 0 ruble bills. Bribr [ru; App Store, Facebook] is a newly-launched iPhone/iPad app that allows anonymous users in Russia to submit the locations and the amounts of the bribes they pay. Later, it will be possible to report on the bribestaken as well. In 2011, Russia ranked 143 out of 183 countries in the Corruption Perceptions Index, published byTransparency International. The meter on the Bribr website [ru]currently shows that 1,795,295 rubles ($58,000) have been spent on bribes since September 24, 2012. The website also has a map – and statistics on the “Who” and “What For” of the Russian bribing (the former contains 14 entries so far, with courts and traffic police topping the list). The goal of Bribr is to show the numbers. Conclusions and opinions aren’t our job. Everyone knows that bribery is common in Russia. But everyone had also known that falsifications did take place during the elections – and only when the observers showed on Dec. 4 how the votes were being stolen at several polling stations, only then did the people take to the streets. It is one thing to know that everyone is giving bribes and quite another to know just how much the 2nd Special Regiment of [the traffic police]is making [in bribes]on Rublyovskoye Shosse (aka Rublyovka, one of the priciest Moscow suburbs). Bribr is not the only crowdsourcing platform tracking bribery and corruption out there. Its currently dormant predecessor in the post-Soviet space – vzyatka.crowdmap.com [ru]– was launched by NewReporter.org/Internews [ru]in March 2011, but lasted only about two months and contains no more than 20 reports. In India, there is the I Paid A Bribe crowdsourcing initiative, which was launched in August 2010 to “[encourage]people to not put up with official abuse of power and to report their stories of bribery to ‘uncover the market price of corruption’” (GV text is here). In May 2012, anti-corruption activists in Kenya launched their own I Paid a Bribe project, modeled after and in partnership with the Indian counterpart (GV text is here).